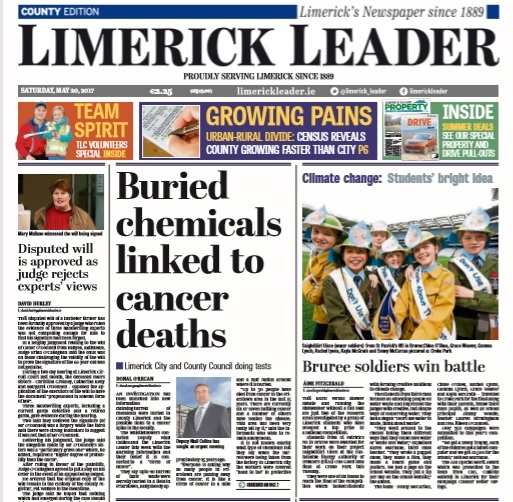 AN INVESTIGATION into barrels of chemicals buried in County Limerick and the possible links to a cancer spike in the locality is continuing a year after the Limerick Leader exposed it. Whistleblowers contacted Deputy Niall Collins and this newspaper with the alarming information and their belief it is connected to a “circle of cancer”. They said up to 20 barrels of toxic waste were secretly buried in a field in Friarstown, Ballysheedy approximately 25 years ago. “Everyone is asking why so many people in Friarstown are passing away from cancer. It is like a circle of cancer in a mile and a half radius around where it is buried. “Up to 30 people have died from cancer in the Friarstown area in the last 15 years. There are currently six or seven battling cancer and a number of others have beaten the disease. This area has been very badly hit by it,” said the informants who wished to remain anonymous. The council commenced an investigation. Over a year later it is still ongoing. Deputy Collins, who put in a query to the council, said they need to engage with the wider community to update them on the extent of work they have done. “The council has been sleepwalking through the process and not keeping the public informed,” said Deputy Collins. A spokesperson for Limerick City and County Council refutes any claims of a lack of response in relation to this incident. As the site is a significant archaeological site, permission had to be obtained from the National Monuments Service to carry out non-intrusive testing to establish areas with disturbed ground and possible ferrous metals. Well water samples in area were taken and broad spectrum testing carried out. Permission was granted by National Monuments Service and then trial holes were undertaken in areas identified. “One trial hole revealed an area containing 12 barrels. Barrels were rusted but most were empty. One barrel contained some liquid. This was sampled and sent for analysis. “Results from the barrel sample were cross-matched with well water samples and showed that contaminants were below laboratory detection limits and/ or less than Drinking Water Regulation limits 2014. As such, it is not deemed an area of concern,” said the council spokesperson. Further permission is being sought from National Monuments Service to expand the area where other barrels have been located to ensure any other wastes on site are removed. “Investigations are continuing and it’s hoped this matter will be fully resolved by the autumn. “The local authority has progressed the investigation, checked for any pollution and is satisfied that there is no risk to the public. “The complainant, the landowner and the local representatives have been made aware of the results, while a statement about the results has been released following numerous media queries,” concluded the council spokesperson. Deputy Collins said he is no scientist but if the barrels are empty then what they contained has gone in to the water course over the years. “There should be an investigation in to who actually dumped it,” said Deputy Collins. Well-known dairy farmer Paul Hannan, who lives in Friarstown, said he was actually looking at the site when contacted by the Leader. “I haven’t been told a dicky bird – we weren’t told a thing by the council. Why didn’t they tell us?” asked Mr Hannan, who lost his father and a sister to cancer. “There is quite a lot of it still around here to tell you the truth. There is a lot of worry in the locality. Nobody has escaped it around here,” said Mr Hannan.